The air is warm, the sun is bright and the faint (and sometimes not so faint) aroma of sunbathing harbor seals fills the air. Summer is molting season. The harbor seals will lose their hair soon. No need for Rogaine or Propecia, though. Our seals will replace their lost hair on their own over a couple of weeks. Since the seals rely on their hair to protect their skin they need it to be in good condition, so their coat is replaced once a year. During this time they tend to spend more time out of the water. We call this "hauling out." Sunbathing promotes more blood flow to the skin and allows for a quick replacement of healthy hair. While they are molting their appetite decreases and they often aren't their usual spunky selves. Growing all new hair is hard work! 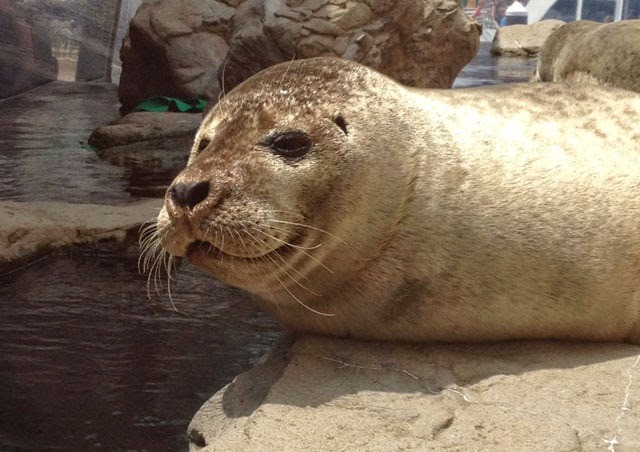 By the end of August all of our harbor seals will have new glossy coats appropriate for any herbal shampoo commercial. All right! This will be a good time to go check them out and get some cool pictures. Do they always haul out on the same rocks? They're looking svelt almost like harp seals. #33: What's in a Name?